MAX. VERTICAL DIGGING DEPTH 7'4"
MIN. TURNING RADIUS W/O SWING 6'7" WITH SWING 5'3"
MIN. 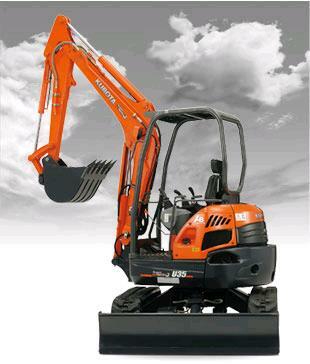 TAIL TURNING RADIUS 33.5"
* Please call us with any questions about our excavator kubta u 35 12 w/thumb rentals in Camarillo, Simi Valley, Oxnard, Santa Paula, Saticoy, and Ventura County.